It won't be too long before the warm breeze of summer wafts it's way into our kitchens. File this Spinach Strawberry Salad recipe under "Summer Salads" and treat your dinner guests to a delicious salad at your summer dinner party. Wait! Spinach Strawberry Salad? We know spinach is good for us, right? And fresh strawberries certainly have their place on our nutritional scale, don't they? But combining them? A salad? A spinach strawberry salad? Really? You will be delightfully surprised when you try this delicious salad. The combination of flavors that all work together in this fruity salad will make your taste buds pop! There is a sweetness, a tartness and a pungent flavor all melded together. 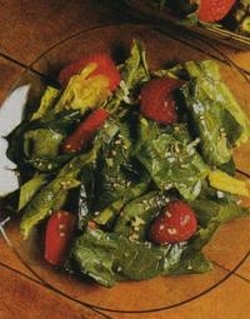 This salad is especially good in early summer when you can get very fresh strawberries. In fact, if you can go pick your own (or even grow your own) that's even better! Personally, I would opt for the fresher strawberries and perhaps, if local spinach isn't available just yet, but the grocery store baby spinach rather than the other way around. This delicious fruity salad has a personality all its own - check it out! are golden brown. Set aside. rinse again and spin dry. onion, paprika and Worcestershire sauce.